Spend 3 nights at Hayfield Manor, named to Conde Nast Traveler Gold List 2009 Best Places to Stay in the World and rated the number one hotel in County Cork on TripAdvisor. 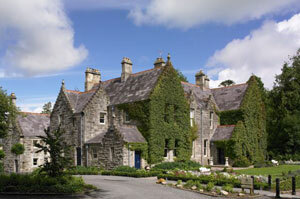 Then travel northwards through Ireland’s heartland to the Castle Leslie Estate for three nights. Castle Leslie is an authentic castle from the 17th century set amidst 1,000 acres of rolling Irish woodlands and lakes. Arrive in Shannon, Ireland, and pick up your Hertz rental car. Drive to Cork for a 3-night stay at Hayfield Manor. Ease yourself into Irish daily life on your first day – enjoy a walking tour of University College with options for scheduled tours from the visitor center combined with a tour of St. Finbarr’s Cathedral. Lewis Glucksman Gallery is on the grounds of the University and has a wonderful café! Shopping is good in Cork city, it might be a good idea to stretch the legs on the first day and get to know the city. Set within two acres of mature gardens, Hayfield Manor is a calm sanctuary within the vibrant city of Cork. Allow Hayfield Manor, Cork City’s premier 5 Star hotel, to become your home away from home. Enjoy 20% off discounts on all spa treatments at Hayfield Manor. Visit Blarney Castle and the famous Woollen Mills in the morning. We recommend a tour of Cork City. Highlights include the Crawford Art Gallery, the old Cork City Gaol and the English Market, a gourmet’s delight. Visit Fota House and Gardens. Exploring the gardens is free. Visit Cobh, last port of call for the Titanic and departure point for over 2 million immigrants, memorialized at the Cobh Heritage Center. Visit the cathedral in Cobh overlooking the harbor. Time permitting you will enjoy a visit to Middleton Distillery, about 20 minutes east of Cobh, with an excellent whiskey tasting on offer. For dining we recommend the Farm Gate, a good traditional Irish restaurant. After breakfast head north through Ireland’s heartland to the Castle Leslie Estate in County Monaghan for a 3-night stay. En route you will have many options including the Rock of Cashel in Tipperary or the fascinating medieval city of Kilkenny. Unwind at Castle Leslie. Activities available on Castle Leslie’s 1,000 acre estate include horseback riding through ancient woodlands for one hour, fly-fishing for pike for two hours, boating for two hours on the estate’s lake or a 30 minute facial, manicure or back massage in their Victorian Treatment Rooms (activity must be pre-booked). Within an hour’s drive walkers can enjoy a ramble in the Mourne Mountains and golfers will delight in world class golf at Royal County Down. An hour drive north-east of Castle Leslie you reach the provincial capital of Ulster, Belfast. Head for Carrickfergus and then on to Larne, leave the beaten track and follow the spectacular, uncongested coastal route through villages where time has stood still. Enjoy the breath-taking Nine Glens of Antrim . . . cross the Carrick-a-Rede Rope Bridge and marvel at Dunluce Castle, perched dramatically on towering cliffs high above the North Channel. 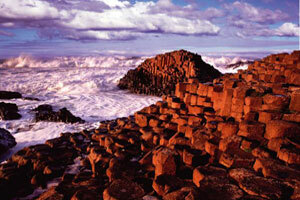 Visit the oldest distillery in the world atBushmills and end the day at the amazing Giant’s Causeway. Only 20 minutes from Castle Leslie is Armagh, the ecclesiastical capital of Ireland where you can visit the Palace Stables and St. Patrick’s Trian. Visit the Royal School and County Museum on the green lined by attractive Georgian houses. A short drive west of Armagh is Navan Fort, the ancient capital of the Kings of Ulster, one of the most important archaeological sites in Ireland. Drive to Dublin for your return flight home. Enjoy some duty free shopping before you go. Slán abhaile! You may wish to extend your stay by adding an additional night to one or both of the accommodations above. Other attractive add-on offers are available for Dublin, Offaly, Waterford, Clare, Galway & Killarney. Trip protection insurance is available and highly recommended. 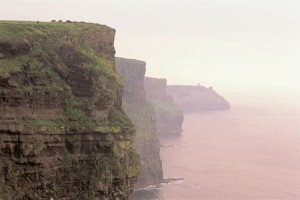 Confirmed Deluxe Accommodations for 6 nights at luxurious Irish Hotels. Your choice of Transportation: Standard car rental with unlimited mileage for seven days. Upgrade to Automatic transmission only $45 OR Upgrade to the services of a Professional Driver/Guide, luxury car or van, including all driver expenses.